← Does being slim mean you’re healthy? 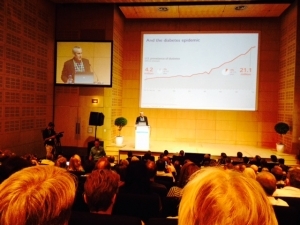 The first ever international LCHF conference was held at the Cape Town Convention Centre last weekend. The line-up of speakers was seriously impressive and the organisation of the event was brilliant (thank you Karen Thompson and Prof. Tim Noakes). It was a privilege to attend the 4 days, and absorb all the knowledge these thought-leaders had to share with us. Each lecture approached the topic from a different angle, which made it all the more interesting to see how our diets affect so many different aspects of our life and health. Thanks must also go to Old Mutual for their support in providing the platform for information sharing and learning. The stats delivered by Dr Peter Bond, Chief Medical Officer from Old Mutual, were sobering. Many people don’t even qualify for life cover due to ill-health, or they have to pay up to 50% more. 25% of children under 18 years of age are overweight. Heart disease kills 200 people in SA every day. 7 out of 10 women are obese (which is double the global rate). It is not a pretty picture. South Africans are getting sicker and fatter, and so are our children. Gary Taubes delivering his presentation on day 1. Gary Taubes, science writer and author of the most brilliant book, Why we get fat, stated that the reason why we get fat is ” insulin”. The paradigm of eating less and exercising more, as well as trying to balance calories in with calories out just doesn’t work. It is carbohydrates that drives insulin, and insulin is what stimulates fat storage. The solution to weight loss? Restrict refined grains and sugars. Zoe Harcombe, nutritionist and obesity researcher started her presentation with, “In the last 30 years we have increased obesity rates 10 fold“. In the 1970’s we changed to new dietary guidelines, (which emphasised carbs and restricted fat). These changes were implemented without any supporting evidence or clinical trials. What should we be eating then? We need to go back to eating what we ate 30 years ago. Thirty years ago people were still eating real food consisting of plants, animals and healthy fats. They ate organ meat such as liver, which is one of the most nutritious foods on the planet. According to Christine Cronau, nutritionist and author of Fat Revolution, it is about finding your “own unique LCHF sweet spot”. What works for one person might not work for another. If you are insulin resistant she recommends following a ketogenic diet for around 3 months to heal the body. But don’t we need the fibre from healthy whole grains? Well, this type of fibre actually just tears holes in your gut, and is therefore very damaging to the bowel. Some more interesting facts – healthy fats actually prevent heart disease, sugar causes premature ageing due to connective tissue breakdown, and a low-fat diet causes gall stones and increases your risk of stroke. Also, low-fat diets damage the thyroid, whereas an LCHF diet heals the thyroid. Dr Eric Westman, an expert in the field of ketogenic diets, explained that carb restriction lowers insulin, which enables the body to burn stored fat. The burning of stored fat should be the primary goal of any weight loss programme. You don’t just want to lose weight, you want to lose fat weight, while maintaining muscle mass. Low fat diets don’t work for those with insulin resistance. Low carb diets improve blood pressure, reduce triglycerides, increase the good HDL cholesterol and lowers blood glucose. He confirmed that LCHF diets work and are easy to follow, because your appetite naturally goes away. The bonus is that besides losing weight, an LCHF diet also fixes many metabolic issues. Dr Jay Wortman, a recognised authority on ketogenic diets for the treatment of obesity, metabolic syndrome and type 2 diabetes, started his presentation with a very powerful statement, “We have a health care system that doesn’t care about nutrition, and a food system that doesn’t care about health“. Mmmmm, that gives us some serious food for thought. He went on to say that chronic disease starts with insulin resistance. You can have insulin resistance years in advance of having type 2 diabetes. One cannot ignore the role of insulin and leptin. Hormones play a big role in why people get obese or diabetic. One of my favourite speakers was Dr Jason Fung. He asked the audience, “What causes insulin resistance?” The answer – INSULIN. Therefore obesity is not what causes type 2 diabetes – insulin is. How often we eat is also critical. He stated that we are just eating too (beep) much and too often – yes, he used the “F” word for emphasis, but it sure got everyone’s attention! Frequent meals and snacking causes high and persistent levels of insulin, which leads to insulin resistance. Here is another scary statistic – obesity rates in 6 month old babies have tripled. This is because there is an association between pregnancy weight gain and birth weight. The mother’s insulin levels affect the infant’s insulin levels, and gestational diabetes dramatically increases the risk of the baby developing diabetes. So going low carb is the best way of getting insulin levels down and treating obesity and diabetes. I have so much more I want to share with you, so please watch out for Part 2 of the series, “Nuggets from the LCHF 2015 conference. Coming soon…..
Posted on February 25, 2015, in LCHF 2015 conference and tagged diabetes, insulin resistance, LCHF 2015 conference, obesity, Old Mutual Health Convention. Bookmark the permalink. 4 Comments. Hi Ian, you are so right. I have been meaning to change that for ages. Thanks for the kick up the bum. I don’t want to mislead anyone. Really wish I could have attended that conference. So interesting.